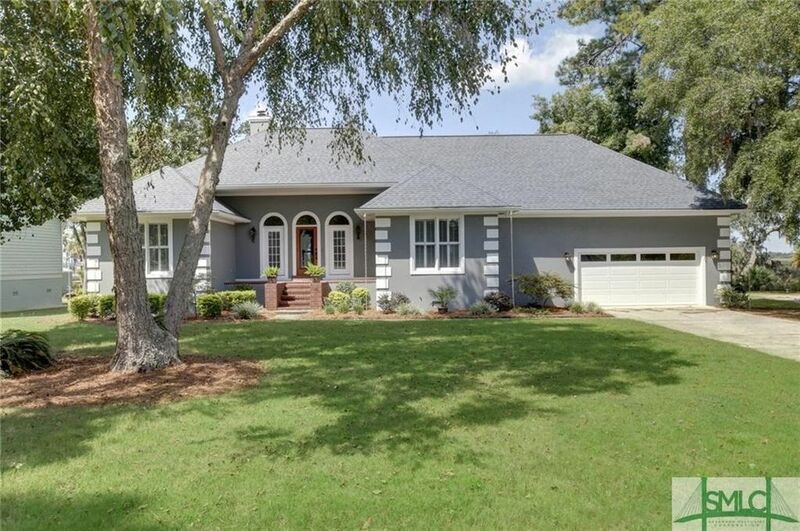 Marsh front with gorgeous views of Intracoastal Waterway and Savannah River. Watch all the boat & large ships traffic Affordable Waterfront! Open floor plan with split bedroom design. Vaulted ceiling great room w/new french doors. Hardwood floors and new paint throughout. Kitchen with white cabinets, granite counters, gas cook-top, and large pantry. Stainless upgraded appliances. Master bath with whirlpool tub, separate shower and double vanities. Door leads to screened porch Large bonus room/4th bedroom. Separate dining room could be 5th bedroom. Updated HVAC. One level living -but bonus room up. Deck and screened porch. Quiet cul-de-sac street just off Islands Expressway - 10 minutes to downtown or the beach. Directions: Islands Expressway to East Pines Subdivsion--turn on Riverview near Frank Spencer boat ramp.